Join us at Holy Trinity for our Family Advent Wreath event! 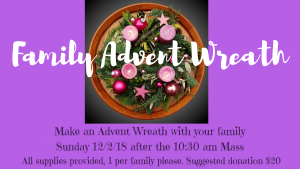 Following the 10:30am Mass, families are invited to come and make an Advent wreath. All supllies will be provided (1 per family). Suggested donation is $20.